Material: Zamak lock body and lock cylinder. Finish: bright chrome plated standard. Feature: 90 or 180 degree rotation both acceptable. 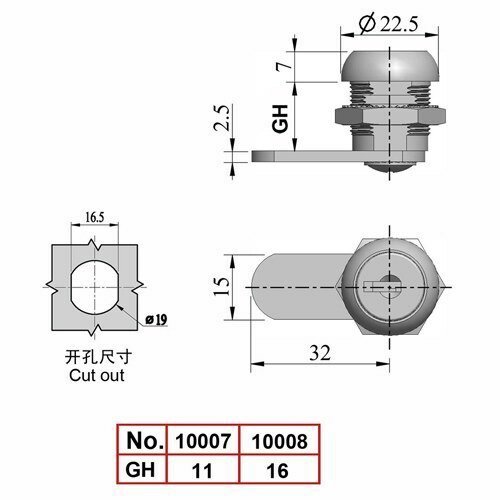 Mingyi Light is professional as one of the leading manufacturers and suppliers of 10007 cam latch master key system zinc alloy die cast and rotation angle 90 degree or 180 degree cw or ccw varous length in 11mm and 16mm in China. And our factory is located in the convenient city, Quanzhou, enjoying convenient transportation. Please rest assured to buy general products with us or try our customized service.